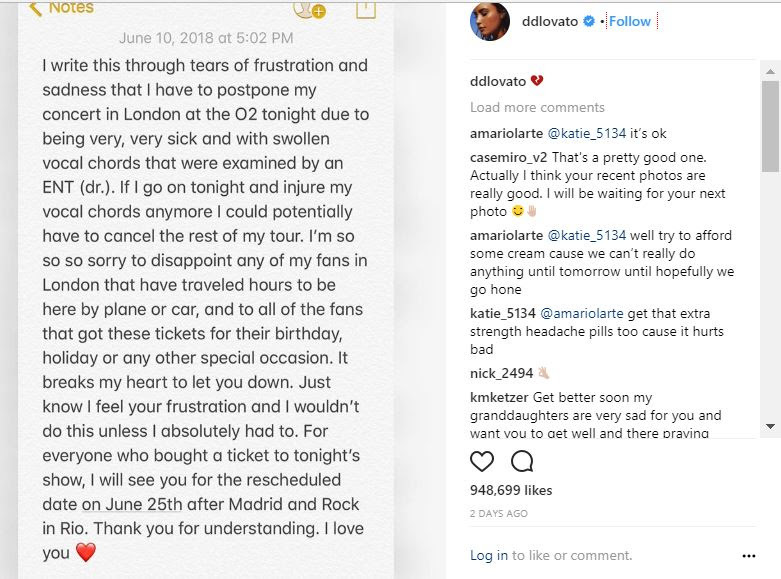 Demi Lovato has postponed yet another show on her UK tour due to swollen vocal chords. The US singer was due to perform at the O2 in London, but pulled the date at the last minute at the weekend- telling fans that she was “very, very sick”. The show has now been pushed back to June 25 and she’s also pulled her show in Birmingham, pushing it back to Friday, June 29. She said: “I write this through tears of frustration and sadness that I have to postpone my concert in London at the O2 tonight due to being very, very sick and with swollen vocal chords that were examined by an ENT (Dr.). This comes after Lovato was forced to apologise after she faced backlash for revealing a prank that she pulled on her bodyguard.